Fantasy, meet reality! For years, people who are typically into fantasy and science fiction and whatnot were beaten up for being nerds and outcasts by the dudes that played sports. That’s just how it used to go: if you were busy working on your Comic-Con outfit, you should expect some antagonizing comments, at the very least, from people who don’t understand. Then Harry Potter came. No, not the real student, the fictional universe from author J.K. Rowling. All of a sudden, geeks are welcomed with open arms and you’ve got people playing the fictional sport of Quidditch in the middle of Central Park! The event is the brainchild of Alex Benepe, son of New York City’s parks commissioner. He organized the exhibition match between the Bronx School of Science and Lenox High School of Lenox, Massachusetts, to raise money and awareness for the International Quidditch Association. 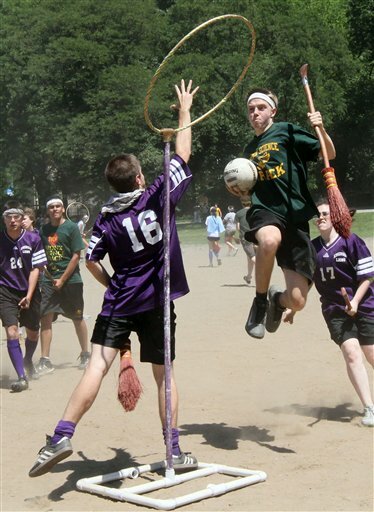 It’s a foundation to promote both the sport of Quidditch and a love of literature. There are some subtle differences, as you can see. For one, nobody’s flying on a broom. Instead, you have to keep your broom between your legs as you run, dodge, and score. A volleyball replaces the quaffle, and a dodgeball replaces the bludger. The snitch isn’t a flying golden orb with wings, but a fast guy with a tennis ball in a sock. If you think the game sounds both goofy and fun, you’re probably right.